The Amiga was a computer series from Commodore, which sold the ruin company Amiga Inc in 1984. The first AMIGA models was sold in the shops at the end of the year 1985. It was the AMIGA 1000. Developer and father of the AMIGA was Jay Miner, who was born in Arizona (1932) and died on 20. June 1994. He resigned at Commodore in 1989. In March 1989 the one million AMIGA was sold. 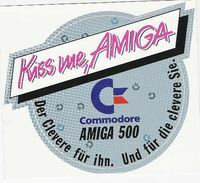 It was sold 7.2 millions AMIGAs worldwide and in Germany round about 1.68 million times until 31.12.1993. The contrast is, that the C64 was sold over 17 million times (1983-1994). 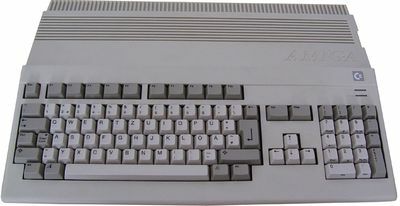 In 1995 the trademark AMIGA was sold to the companies Escom (1995/96), Gateway 2000 (1997-2000), Amino (2000-2004), KMOS (since 2004), which produce other AMIGAs with PC technology inside. This page was last modified on 14 April 2015, at 02:15. This page has been accessed 15,758 times.